‘Walter Meyer 2007’, a solo exhibition of oil paintings by the artist, was hosted from 29 November to 15 December 2007. In this collection of paintings, selected over a two year period, Meyer portrays some still lifes and explores the changing landscape from Camps Bay, via the Kalahari and the Namib up to Luderitz. In his masterly style, Meyer manages to capture the mood and soul of these uniquely African scenes, evoking all the different emotions one experiences when visiting them. Walter Meyer’s earliest memories are of landscapes – not people or incidents. His relationship with the Southern African landscape is rooted in his emotional and spiritual experiences while living in, or travelling through it. Meyer’s paintings highlight the insignificance and transient existence of man – in vivid contrast to the overwhelming magnitude of nature, where change is inevitable and the old must eventually give way to the new. 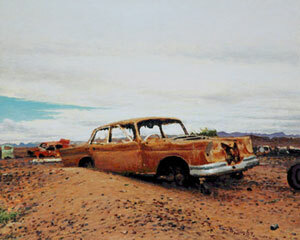 Liese van der Watt, in a Vuka magazine article, expresses her views on the contemporary relevance of Meyer’s town and landscapes as follows: What makes his landscapes so notable and interesting is the way in which they respond to and, more importantly, depart from what has become a rather boring, even exhausted tradition of art making. His work is a response to traditional landscape painting because it champions realism. For this reason, his art seems unfashionable, conservative even, in relation to contemporary artistic production here and in the rest of the world where realism, and indeed painting itself, have gone out of vogue. This penchant for realistic portrayal as well as the fact that Meyer prefers to work in the very traditional medium of oil painting, is quite surprising for an artist who received his training in the 1980’s when neoexpressionism, conceptual- and installation art dominated most academic institutions such as the University of Pretoria and the Staatliche Kunstakademie in Düsseldorf where Meyer studied for four and three years respectively between 1982 and 1989 – and indeed produced abstracted works. But it is through the kind of realism which he utilises now that Meyer manages to break away from the medium of traditional landscape painting. In contrast to early landscape painters like Volschenk, Hugo Naudé, Pierneef and even more contemporary ones, Meyer’s is a realism that is completely devoid of glamour or beautification and instead focuses on the ordinariness and banality of the South African landscape and platteland. In relating his work to the 18th century Romantic tradition of landscape painting, Van der Watt writes: …neither the terms romantic picturesque nor charming come to mind. Decay, neglect, abandonment, dereliction rather offer a more appropriate vocabulary to describe the mood of this work which seems ominously close to our present, in fact, too close for comfort. This work is typical of the South African landscape, which is characterised by built structures, dotted by small dorpies, which are enveloped or encased, by an all-expansive landscape. Van der Watt concludes: Meyer’s art describes human displacement. His works retreat from narrative – they carry no promise for a brighter future nor are they nostalgic for a better past. Suspended in the ‘now’, his works proclaim not ownership and authority, but transience and temporary residence. When studying Walter Meyer’s oils, the underlying sense of compassion, honesty and truthfulness is overwhelming. Clearly, his melancholic personality allows the experiences of his soul to be amplified by the mood of whatever metaphor he has chosen from his surroundings, intuitively communicating it through his medium – for our appreciation. This collection of paintings has been selected by us from the greater body of work produced by Walter since 2005.